I did this slide and titled it “the importance of speed” for my presentation in Bratislava. One should add “and the price you pay for speeding (if you crash)”. 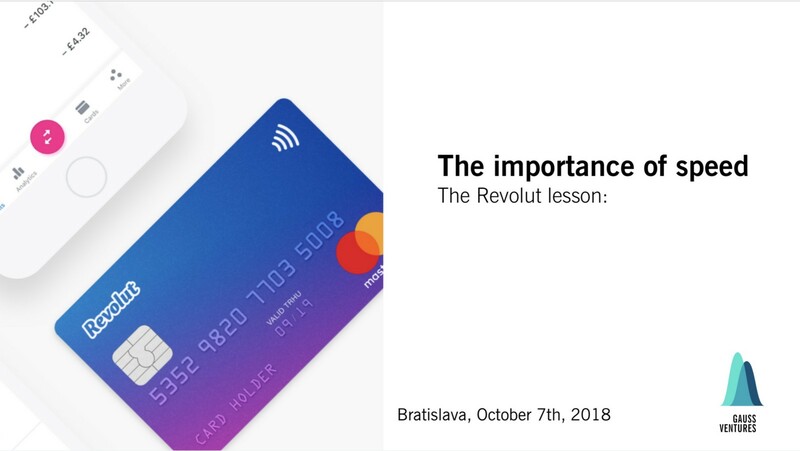 Here in this (planned) short note I want to express and rationalise my thinking about Revolut and its boisterous leading founder — Nikolay, whom I’ve met on stand at Finovate Europe when the product was announced. He is not the most pleasant and outward looking chap I’ve met in my fintech career, but probably not everyone should be. Amid today’s flurry of critical press, the company on the defensive (yet in no way on the ropes), i believe one should try rationalise company’s behaviour and see the allegations and invectives in context of company development at the time — and try to see how young companies see the world as they swoosh past at great speed. The incumbent world is starting to dig deeper as it get suspicious about the neobanks encroaching on them. The latter, call them fintechs or neobanks or platforms or whatever - while receiving laudatory remarks on their forays, achievements and milestones, as they hit millions of users, unseat big banks in market indices and proclaim the world is nigh for a change, — should be careful not to eat a poison pill as they try to eat incumbents lunch. When opportunity came our way, as we were tinkering the first private-office VC for our sole GP, we went in and invested in Revolut in 2016, doing proper statutory checks as part of the due diligence process and nothing suspicious came on our radar. Not that everything was ideal — little number to no company are all static and cast in bronze — they are fluid creatures inheriting their founders personalities, their flaws and their drive — hence it’s a gamble to invest not in tech but in team spirit and perseverance. The pressure to prove your platform can take over the world is huge. So is the payout — and the market leverages ambition with every decent proposition it can find. Billions are poured in the new constructs that aim higher, grow faster and redo the processes that constitute an industry. And a heavily regulated industry it is — so the hope is that one can somehow change the elements used to manage the back-office, to allow it support the appealing front-office proposition. All viral platforms suffer at some point and the definition of greatness is in those cases where company learns from its mistakes and improves as it goes forward. There is no second chance to fail later — the vortex of investor pressure to continue the MoM, YoY, DAU/MAU and stickiness leaves little wiggle room. Rumours of cooking daily sign-ups through reversal schemes is sad to hear, yet it comes from a well designed gamification /referral the app possess. Turning a blind eye on how compliance meets a surge in user sign-ups is deafening for an incumbent, yet for a founder-led company this can be perfectly explained: a company now going from USD 1.7 to a rumoured 3 billion valuation, trailed by competitors (there can be only one, maybe two global neobanks who would be allowed to carry much higher valuations — where regionals would be acquired or left with valuations stemming their growth). Hence the alarm and focus on top-line, not bottom-line. One should put the allegations of compliance misdeeds, as reported in BBC and originally also written about in Wired UK in context to when they have supposedly happened: 2016. The company had 200K users at most (and we are actually talking registrations, since travel money card that Revolut was and largely still is at the moment is used occasionally) and close to 15K DAU. The compliance system was a rudimentary, component-based concoction that a startup should have — and it did, while potentially planning to redevelop it into something solid as it sped past its competition. It was relentless application of entrepreneurial rigour — but never it should be mistaken with hubris and unchecked ego. It feels similar to audacity — but loosing reality while being pressured by demand for growth from your investors is a painful and toxic process — with small chance for recourse. What next and what lessons should be learned by all? Investing in founders is tricky and companies — and investors should have contingency planning on a company going berserk as it takes the best and worst from its founder.